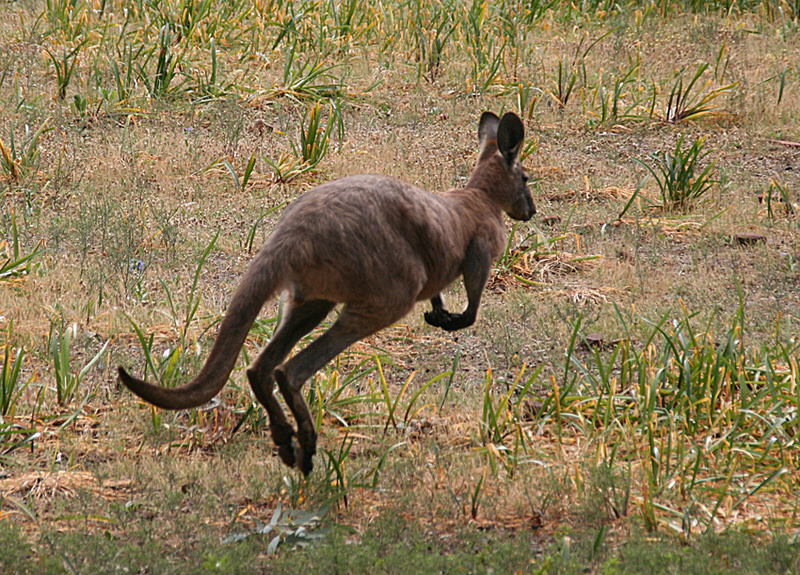 The grey kangaroo is bounding along the small levy that cuts across a shallow clay pan near the edge of a tidal flat. It stops monetarily and twitches its mobile ears, looks around, then continues on its way into the scrub alongside the raised earthen mound. I get a few seconds to make a shot and the wary marsupial is gone. 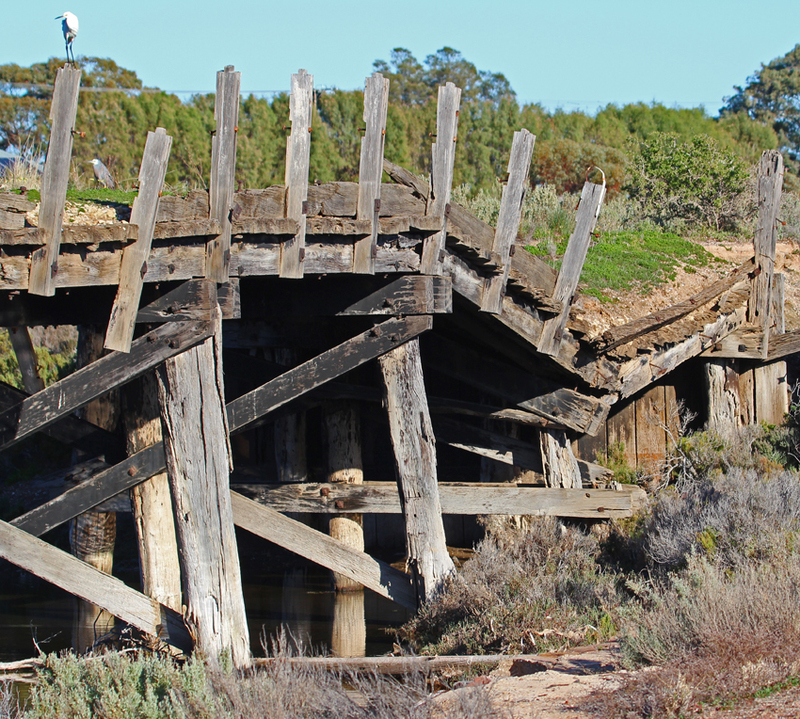 I am exploring the coastal fringe of Whyalla South Australia’s third most populous city. The steel and regional centre is situated near the head of Spencer Gulf on the Eyre Peninsula about 450 kms from Adelaide. The area is a mixture of mangrove, tidal flats, sandy beach and some small industrial areas that enclose substantial freshwater pools. Several roads lead down towards the coast from the Lincoln Highway and some of the terrain requires 4WD. I take the vehicle across one of the mud flats and have to fight to keep from getting bogged. Slipping the SUV into low range and slowly sliding across the surface I wrestle with the steering until the wheels grip sand on the edge of the levy. Relieved, I get out and survey the quagmire of clay-like debris stuck to the wheel arches. But my close call has led me to a cosy little depression amongst the scrub and I decide to move a few fallen branches and search for invertebrates. After a few minutes I unearth a rather large garden centipede and a few Egyptian or ‘cellar beetles’ as well as some different ant species. After a little macro photography I carefully replace their homes. 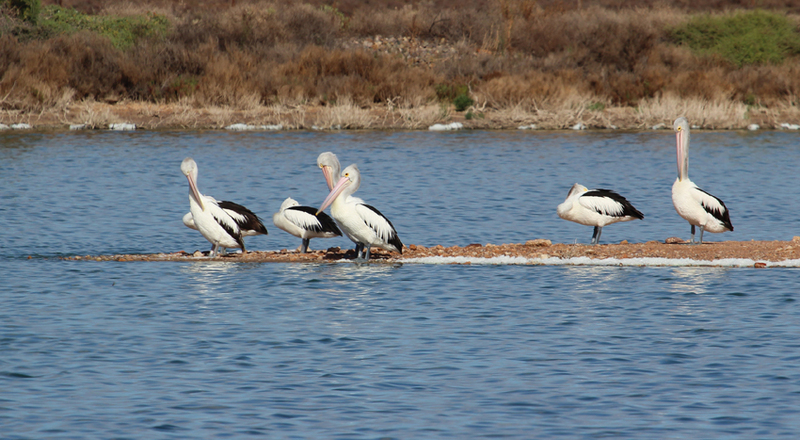 Another dirt road takes me past the rifle club and some large freshwater ponds that have attracted a small group of pelicans. The birds appear to be simply congregating and socialising between short forays into the water to feed. Along the edge of the water there are several different species of small waders including dotterels and plovers but they are wary and take flight when I approach. 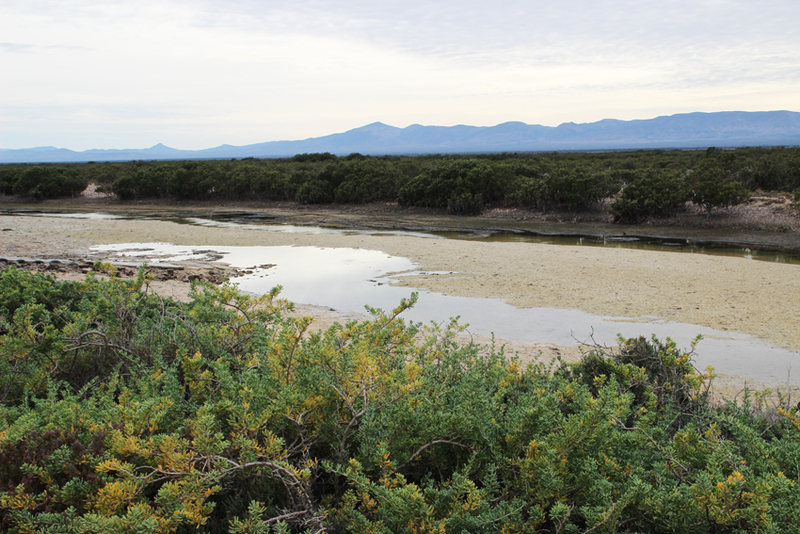 The scrub alongside the mangrove patches is also home to a variety of birds including singing honeyeaters and fantails. 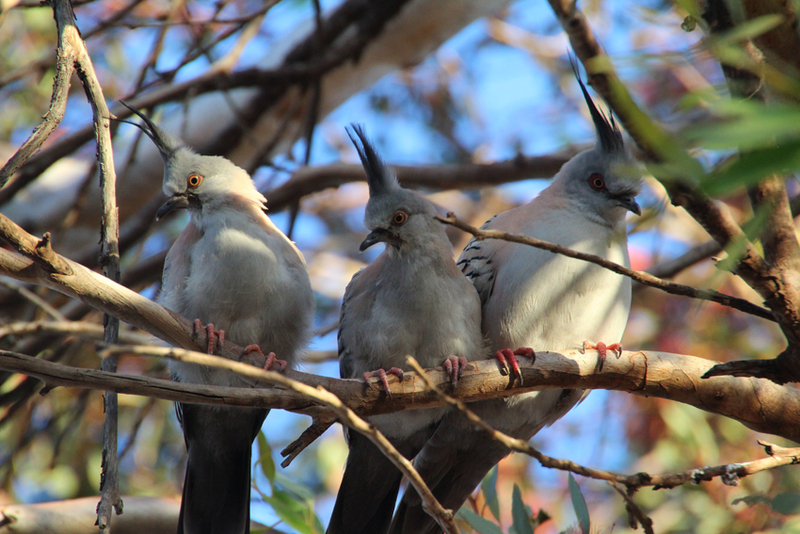 One scrubby eucalypt that has managed to endure decades of salty onshore winds provides shelter for a trio of crested pigeons a species that I often see found foraging in the coastal bush. I head back onto the highway drive back into the city and up to a local lookout. 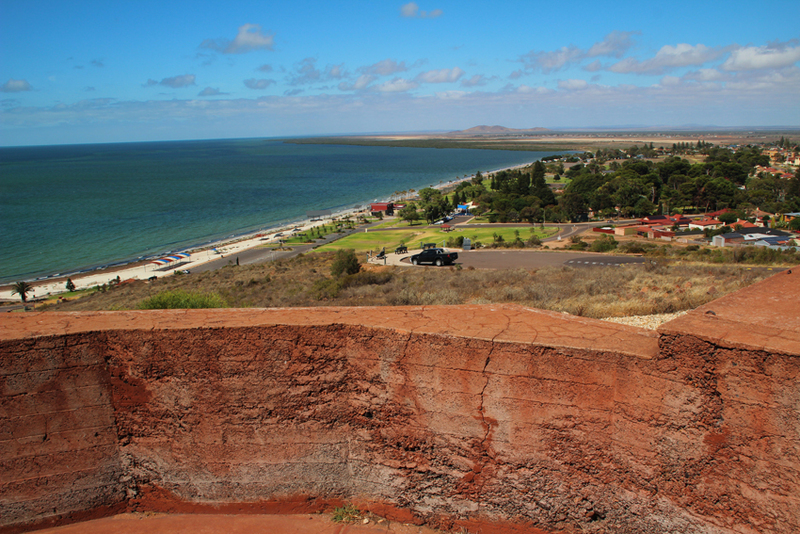 Hummock Hill is a fitting place to end my exploration of Whyalla’s coastal fringe. The site of the first settlement in 1901 it provides panoramic views of the city, coast and surrounding bushland. Hummock Hill also served as a gun emplacement during the Second World War and has lately been developed as an historic site; lovely place to simply take in the rugged beauty that this area has to offer. 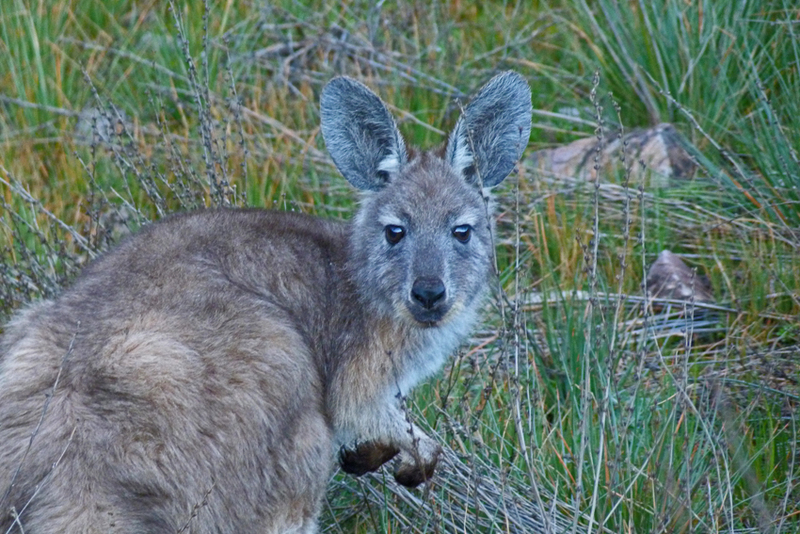 A grey kangaroo pricks up its ears and turns to face us. Half hidden in the grass and further camouflaged by its subtle colouring, the wary marsupial stares for a few more seconds before bounding away towards the shelter of a nearby stand of stunted gum trees. I put the camera back on the passenger seat, raise the window and continue up the rugged track towards the top of the ridge. The vehicle ahead of me has already reached a farm gate and my companions have opened it in readiness. There are a few sheep in the area grazing on the steep hillsides and we have to be careful to maintain good relationships with the farmers who kindly allow the public to traverse their land. 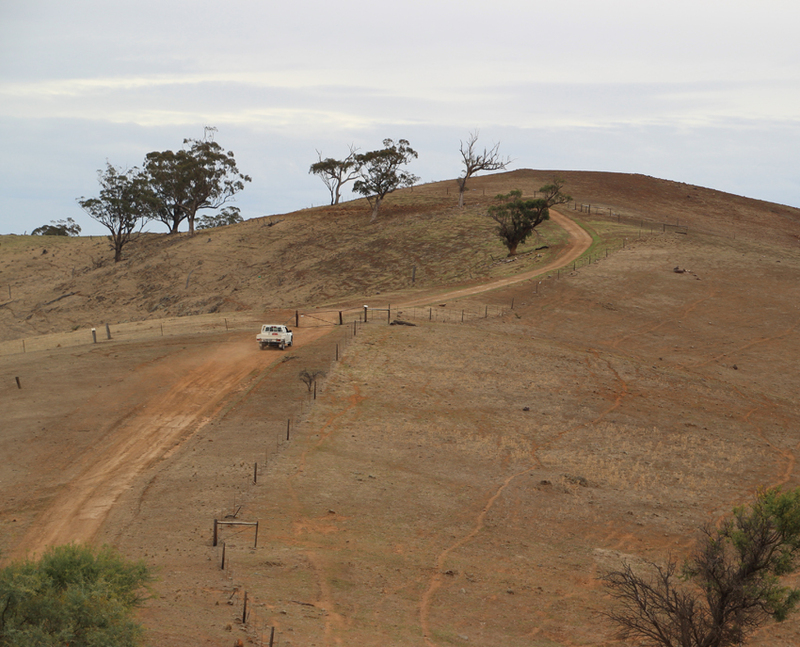 I am driving along the Bridle 4WD track in the foothills of the Southern Flinders Ranges between Port Pirie and Melrose. This is red earth country with deep ravines, open expanses of pasture and small patches of scrub clinging to the windswept hills. 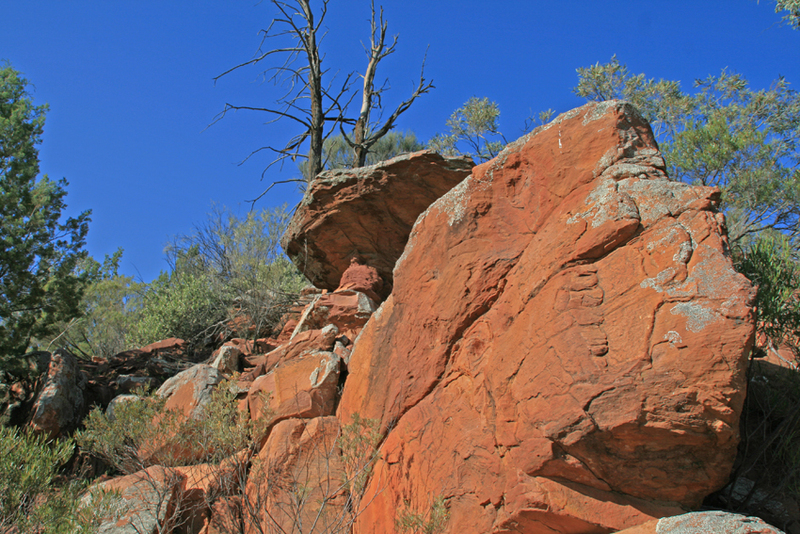 Sporadic rocky outcrops dot the landscape and it is here that one can search for different species such as reptiles and a range of invertebrates. 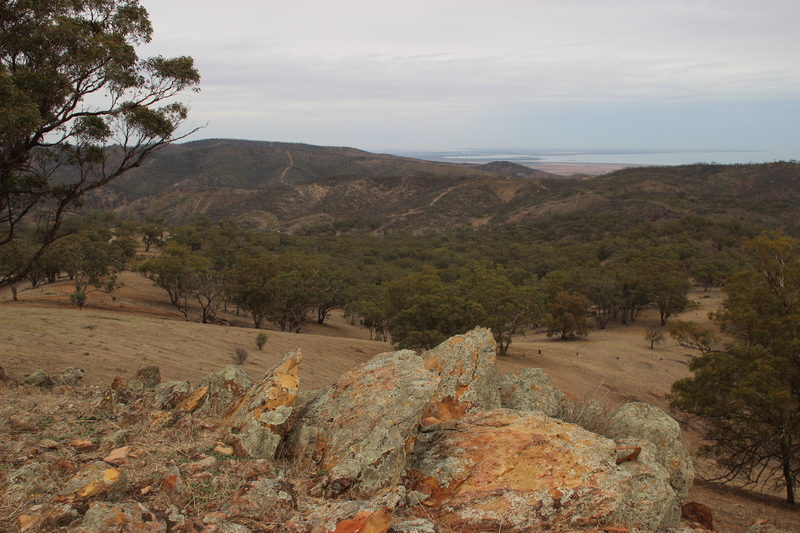 We stop alongside one such outcrop near the top of the ridge and enjoy a wonderful view across hills and bushland to the Spencer Gulf in the hazy distance. 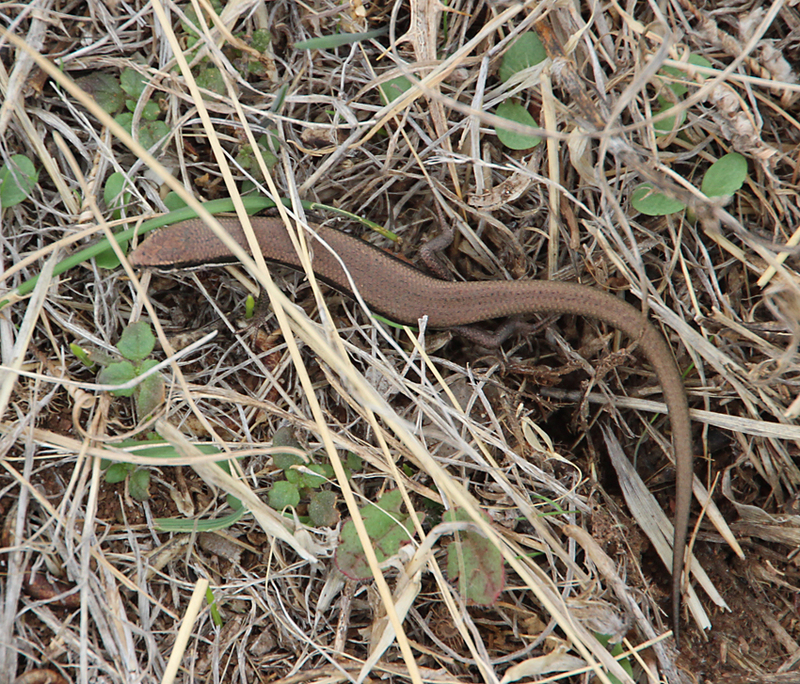 I bend down and dislodge a couple of flat rocks and a small skink darts out and freezes in the long grass. Carefully replacing its rocky home I leave the little reptile to its own devices after snapping a quick shot. The descent towards the coast is quite steep and we need to put the vehicles in low range. 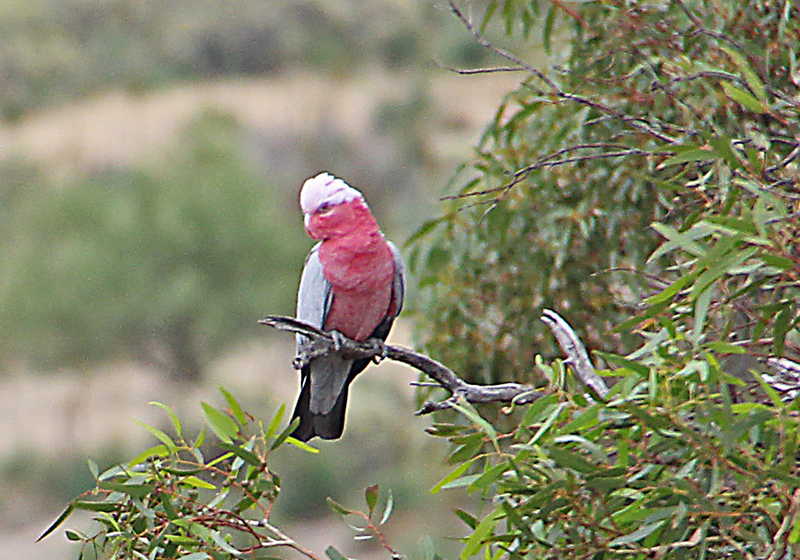 We stop occasionally to take a closer look at some of the eucalypts that grow in isolated patches providing nesting sites for some of the many parrot species that populate this part of the state. 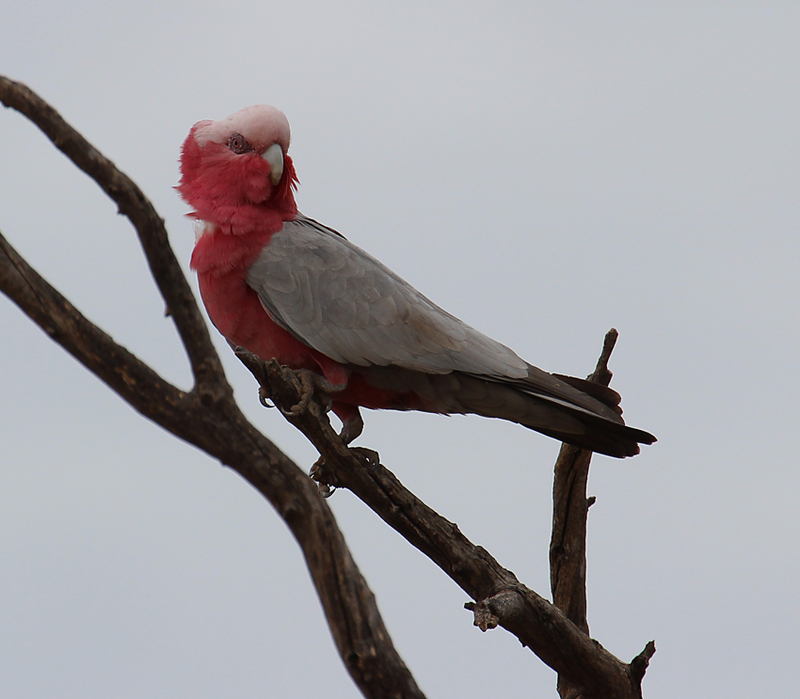 Ring neck parrots, galahs and rosellas are just a few of the species we encounter. Back on the plains we leave the main trail and take a well graded dirt road back to the highway. 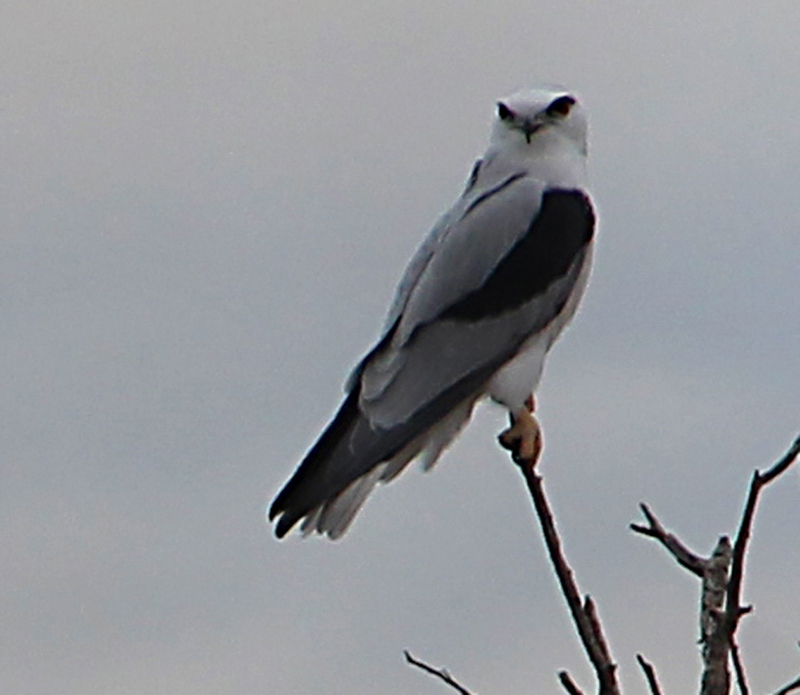 A beautifully marked black shouldered kite watches us from a skeletal branch where it is perched to surveying the landscape for prey. 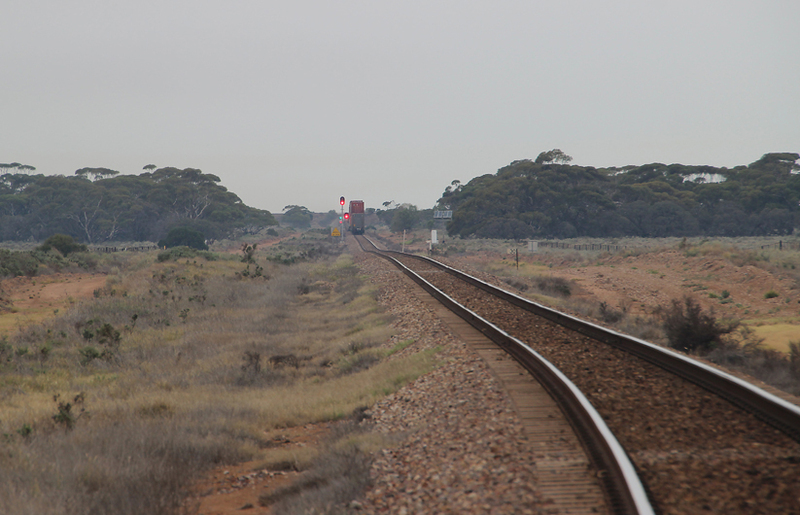 Our final farewell to this bleak but beautiful part of South Australia is the forlorn whistle of a freight train as it clatters over a crossing on the endless tracks that cover the thousands of kilometres between the west and east coasts of Australia. 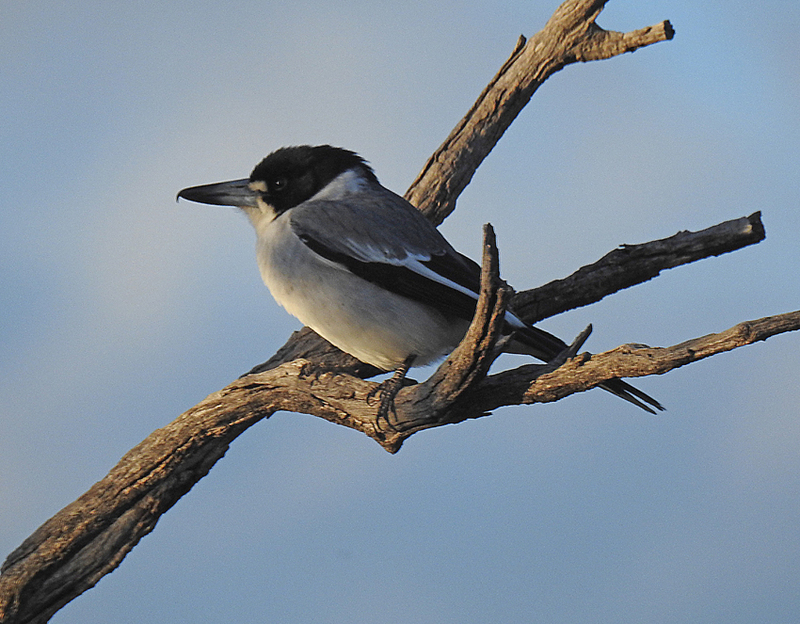 The grey butcherbird is perched on a dead branch on the edge of the mangrove swamp. The powerful bird will use this position to dive on prey in the undergrowth snatching up insects, small reptiles and the nestlings of other birds. 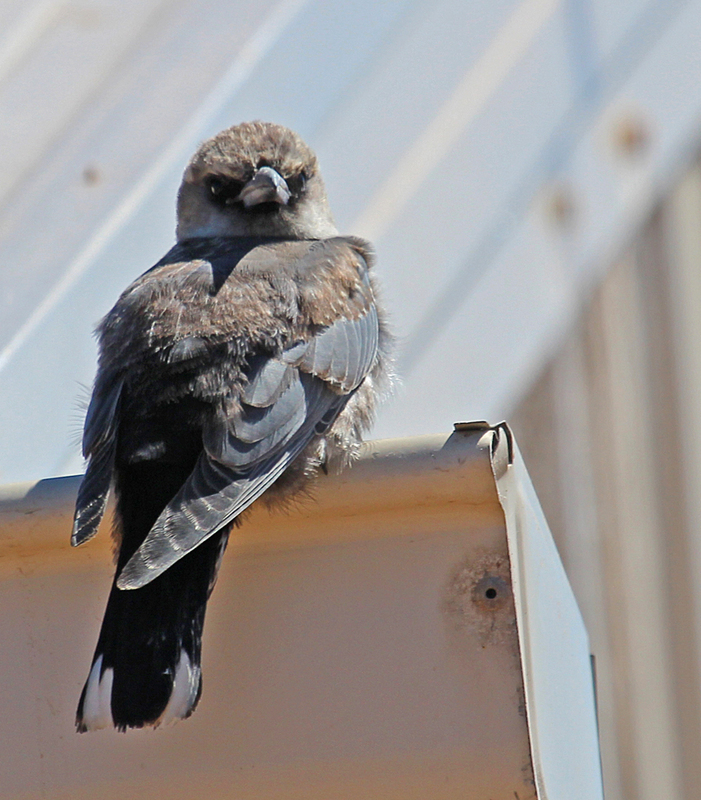 Large prey will be jammed in the fork of a branch then eaten; which provides a hint as to how butcher birds acquired their name. It is sunset and the light is glorious as it defines the mangrove channels against the pale sand. I am on the northern side of Port Germein where a substantial stand of mangroves merges with the shallow beach. Small schools of fish are heading along these waterways towards the ocean as the tide recedes and an odd crab scuttles across the channel. 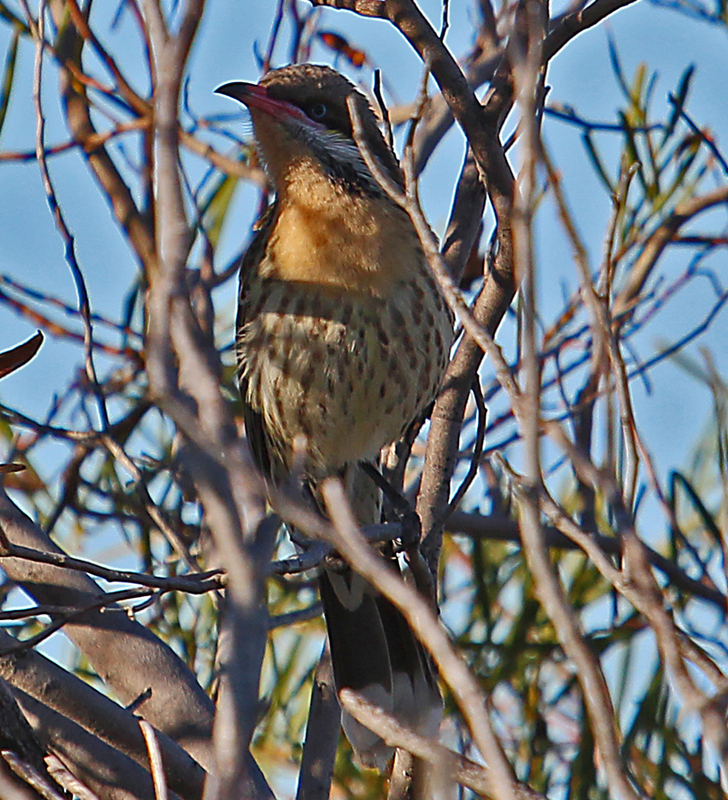 As I climb back into the 4WD I can hear the calls of several different kinds of honeyeaters in the nearby scrub. With the windows open I drive slowly along the rutted trail until one of the little birds appears in the upper branches of the bushes. 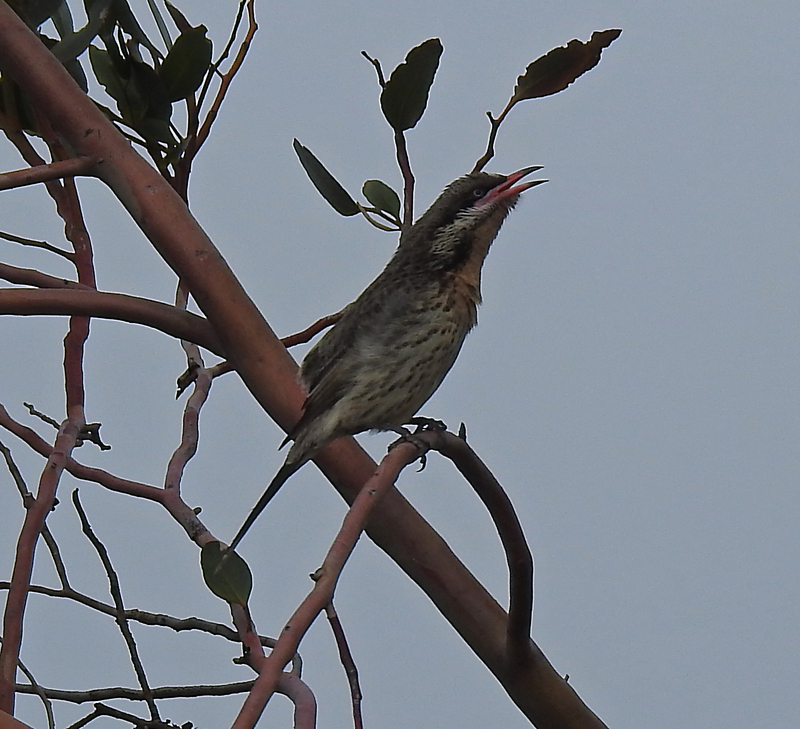 Several frames later I have captured a passable image of a spiny cheeked honeyeater calling to its mate. Often shooting from the vehicle is easier as the wildlife seems more accepting of its presence than that of a large two legged creature stalking through the bush. 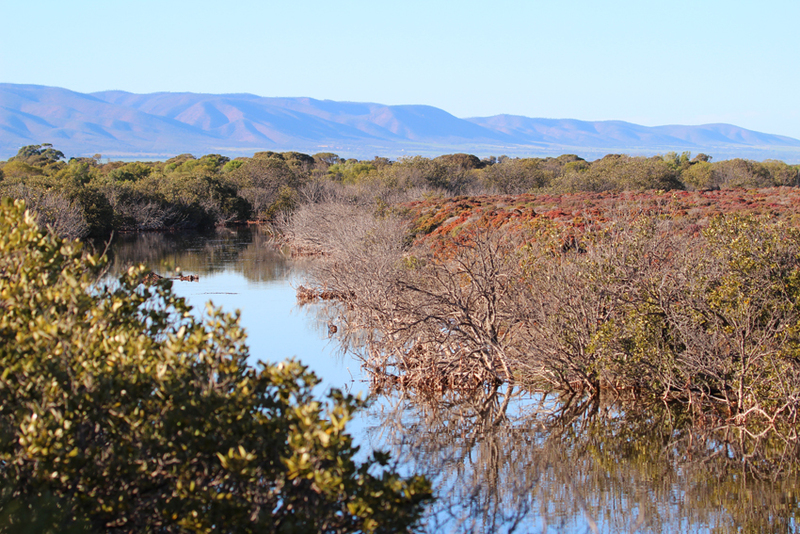 The next morning I walk in the opposite direction to explore a channel that runs parallel to the shore on the southern perimeter of the township with a spectacular view of the Flinders ranges in the background. There are mangroves and samphire right to the edge of the creek which ends in a dilapidated road bridge that once serviced a crossing into town. A white faced heron is sitting on the weathered planks eyeing the water below for small fish while swallows are nesting under the main span. As I make my way alongside the waterway I notice silken sheet like webs, carpeting the ground between many of the bushes. Some are still glistening from the morning dew. 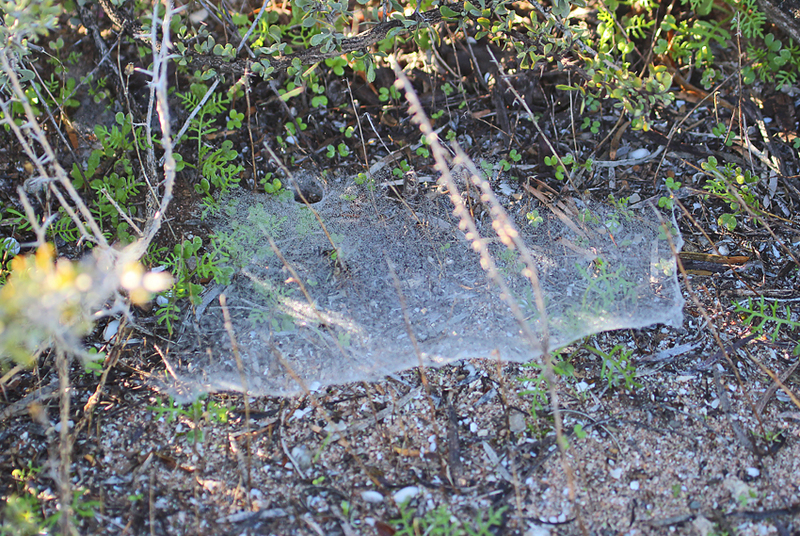 They are used by lattice webbed spiders as a kind of horizontal trap that acts like a sticky labyrinth. With my mangrove walk completed, I head back into town for a bite at the local cafe. 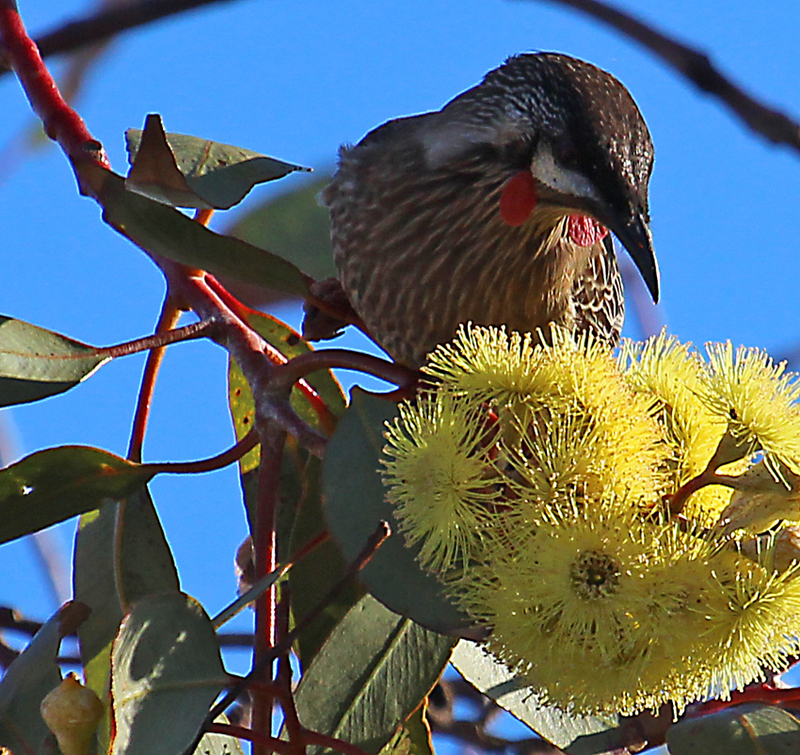 But Port Germein has on last wildlife moment to offer in the form of a wattlebird feeding on some late blooming eucalyptus flowers near the caravan park. 4WD is useful in this area and the walking on the southern edge of town is quite strenuous. The northern reach of mangroves would be suitable for a family or seniors’ excursion. The sand monitor, a kind of goanna, is raised slightly off the ground and peering intently towards me. It doesn’t seem too perturbed by my presence. In fact, I am probably the more excited of the two. 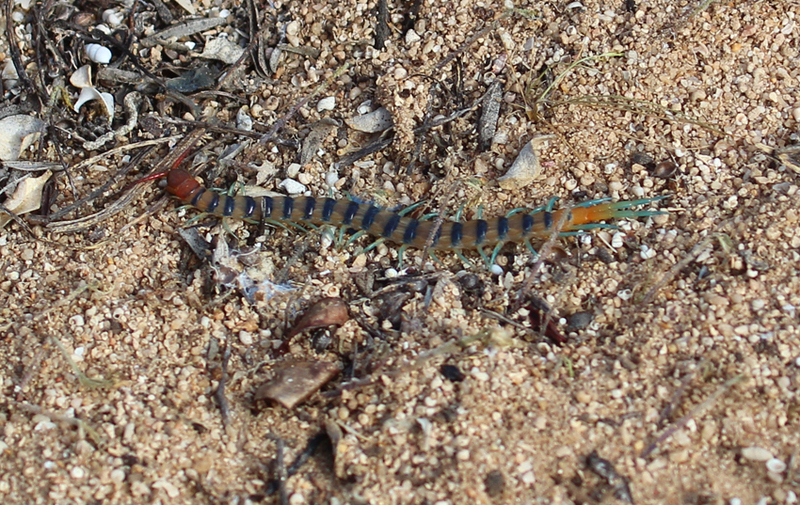 It is my first encounter with one of these lizards which can reach a length of around 1.5 metres. Like all monitors, the sand goanna has a forked tongue like a snake allowing it to use scent to detect the distance and direction of its prey. A closer examination through my camera lens reveals that this animal has been injured at some time and is missing part of its front right foot. 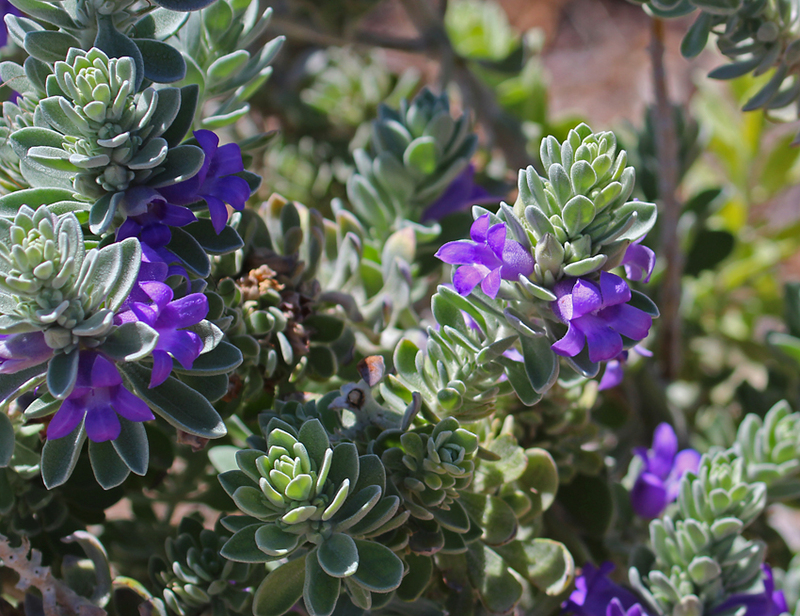 I am in the Arid Lands Botanic Gardens just a few kilometres out of Port Augusta near the head of the gulf. 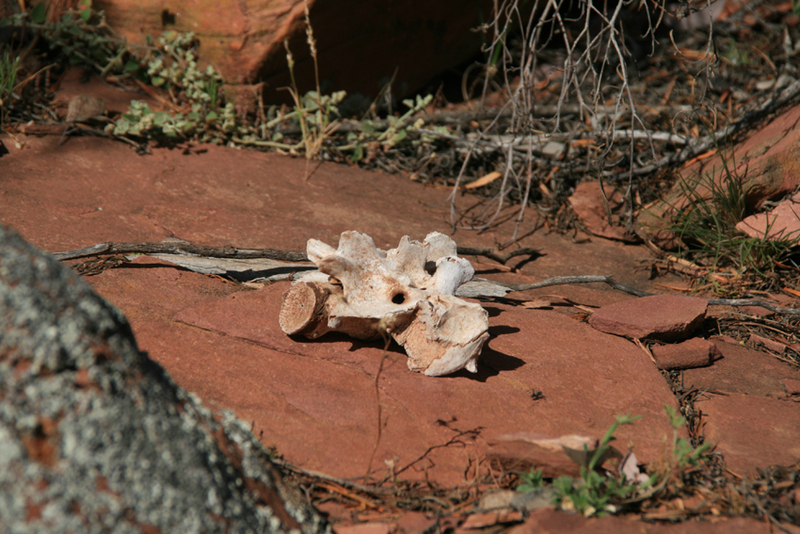 The gardens showcase many of the diverse dry-land ecologies that SA has to offer. Unlike most parks this one is not fenced and the animals that venture into its proximity are wild. Despite its natural status the gardens are well serviced by a modern visitor centre and cafe. 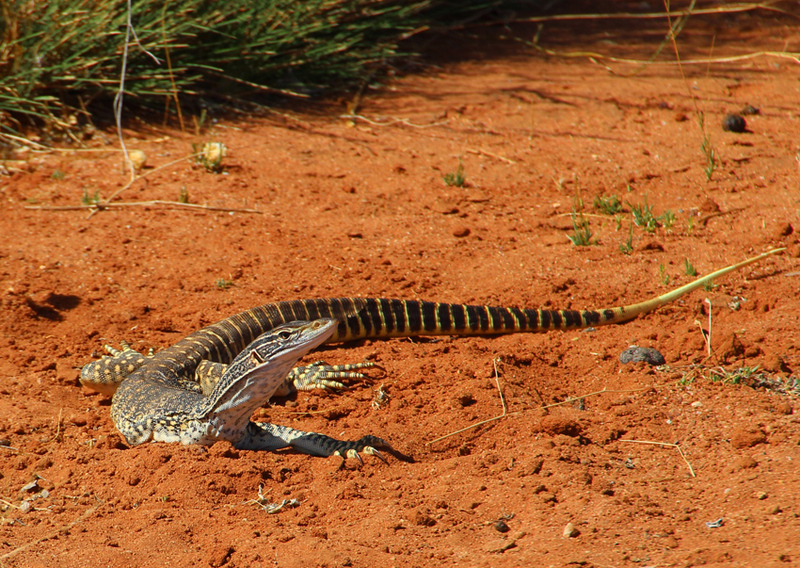 Leaving the sand monitor to its own devices, I walk around the edge of the encroaching scrub towards the extensive eremophila plantings at the back of the centre. 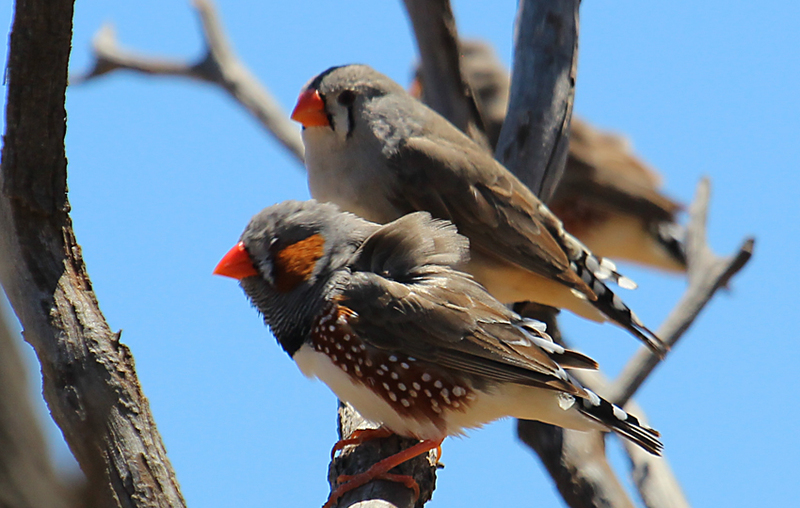 Several zebra finches are perched in the branches of a skeletal tree overlooking a small artificial waterhole. 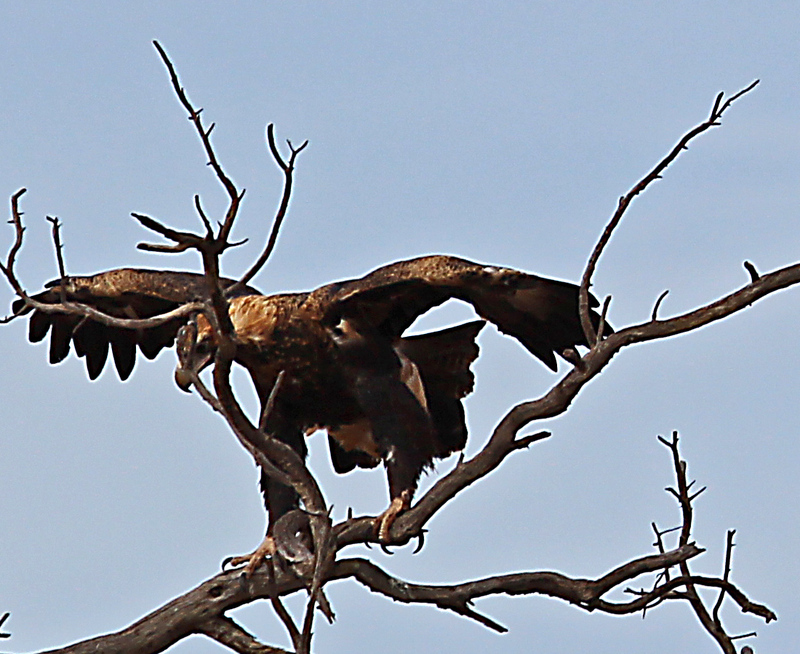 I search for the right image, eventually finding a male and female settled on a dead branch; perfectly demonstrating the difference between the sexes. After spending some time exploring the eremophila shrubs with all their subtle floral variations, I walk around to the northern edge of the gardens. This area includes habitat zones where interpretive signs explain adaptations to climate and terrain as well as Aboriginal use of plants as foods and medicines. While I am reading about how sugarwoods are used as sweeteners and their amazing regenerative powers after bushfires, I hear a rustle in the undergrowth. 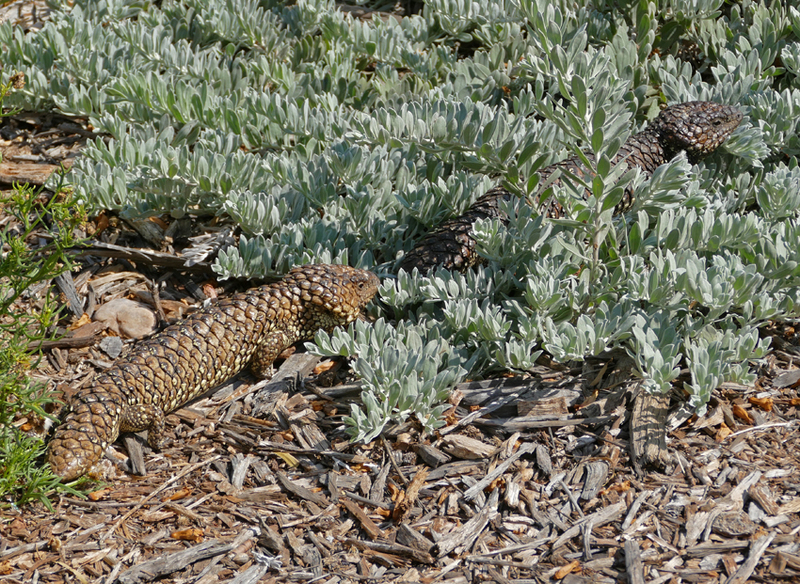 Only a few metres from where I am standing a pair of or shinglebacks are following each other closely between the ground-covers. Sleepy lizards, as they are sometimes known, are essentially solitary reptiles which can only mean that it is mating season. Whenever I visit these extraordinary gardens I conclude my day with a little culinary treat; a light meal, ice cream or scones with jam and cream. But these are no ordinary delicacies. 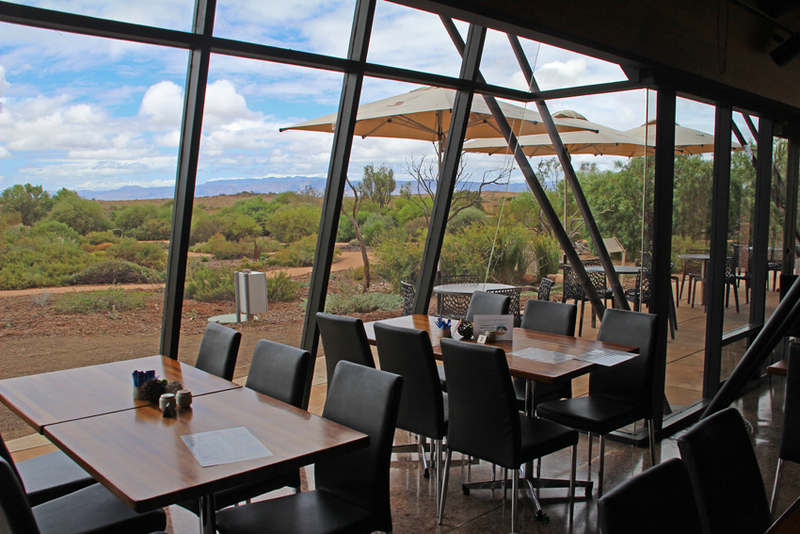 Many of the flavours are created from the landscape with a distinctly ‘bush tucker’ nuance such as quandong ice cream and native herb flavoured damper. It is a cool, overcast afternoon; not ideal for wildlife watching or photography. Nevertheless, I have organised a weekend trip north to Port Augusta to investigate the Arid Zone Botanic Gardens during the winter months. 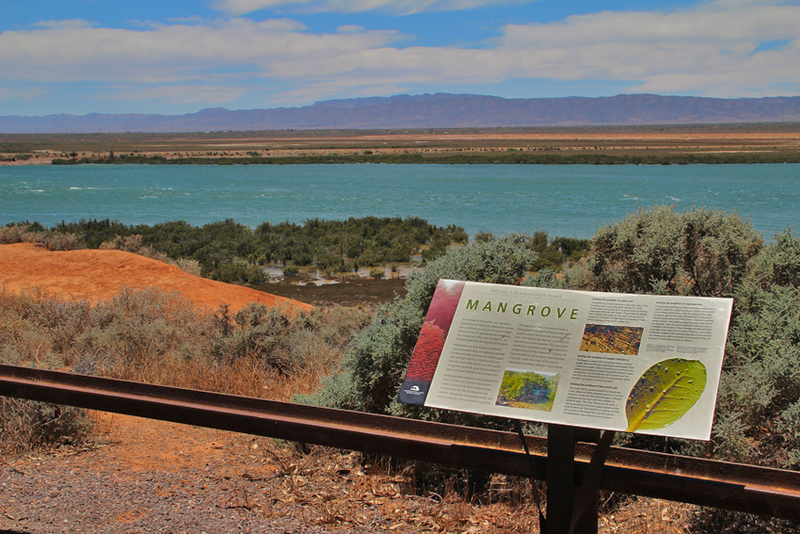 As an added bonus, I hope to explore a shallow mangrove creek some 20kms south of the town that a friend has suggested as an interesting wildlife stop off en route. 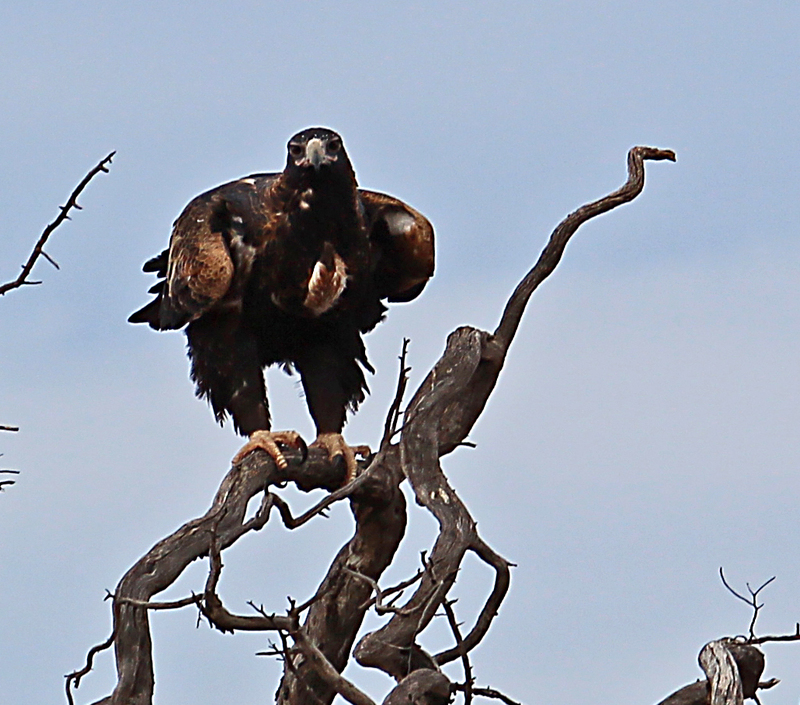 As I approach the Chinaman’s creek junction I notice a pair of wedge-tailed eagles in the skeletal branches of a mallee tree. The birds seem quite relaxed as they survey the low scrub that stretches towards the coast. I let the car roll to a stop and gingerly climb out careful not to let the door bang shut. There is good cover between the birds and myself and I fire off a couple of shots before one bird senses the movement and takes to the air. The stretch of unsealed road that stretches towards the coast is flanked on both sides by scrubby farmland that supports sheep and some wheat fields. 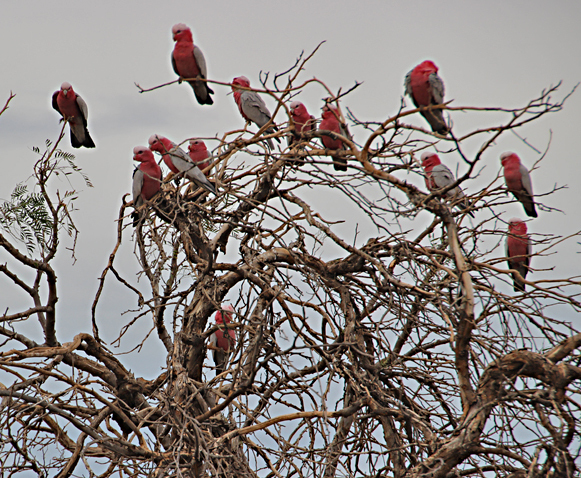 Small groups of rose breasted cockatoos are perching in the branches alongside the road. They occasionally take flight into the fields to dig out tubers and possibly ravage a few of the crops; lovely birds to watch but not always popular with farmers. 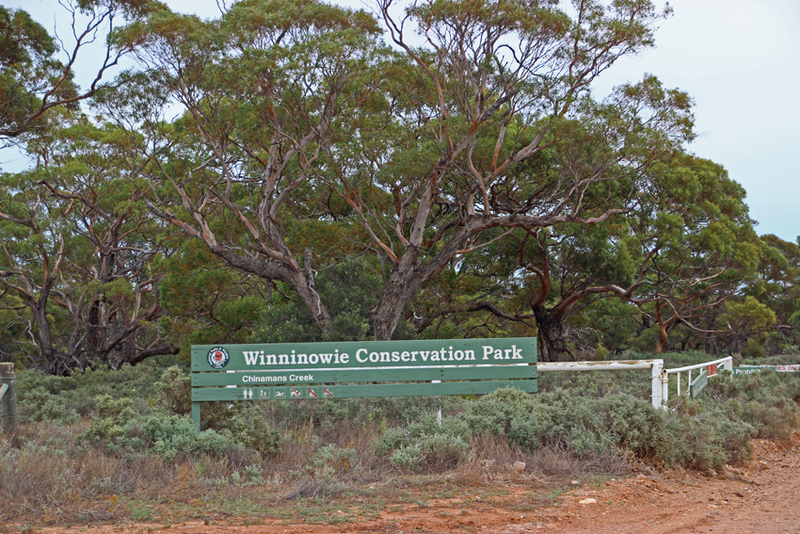 Where the cleared land gives way to forest and denser scrub, a fence and sign announces the Winninowie conservation Park which incorporates Chinaman’s Creek. Despite the remoteness of the area we meet a couple of 4X4s complete with camping trailers and stop to chat with the drivers for a few moments. 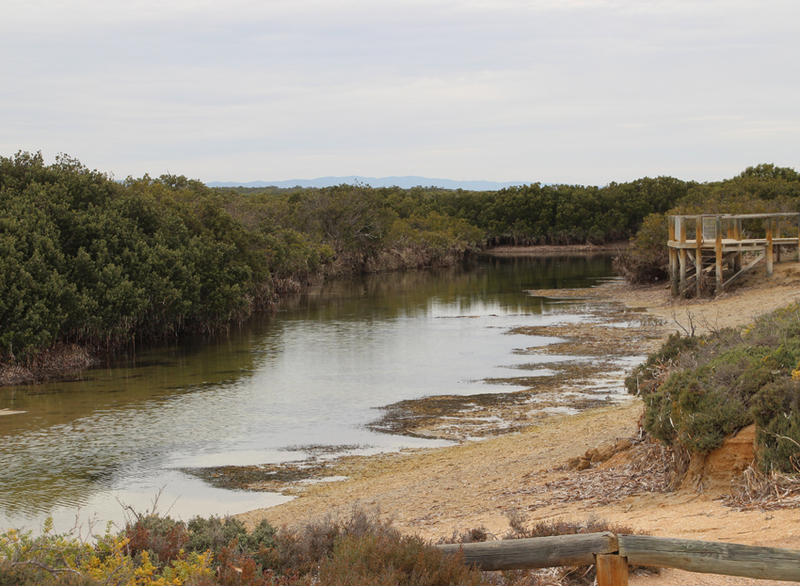 They have been camping by the creek for a few days and had some success fishing the mangrove flats on the receding tide for whiting and mullet. A few minutes later we pull into the camping area. There is a scattering of permanent shacks and a small jetty that is completely exposed at low tide. I change from shoes to gum boots, from experience I know that this mud sticks like glue, and start to walk along the edge of the little creek. I can hear singing honeyeaters in the mangroves and catch flashes of colour from other unidentifiable species that flit amongst the thick foliage. 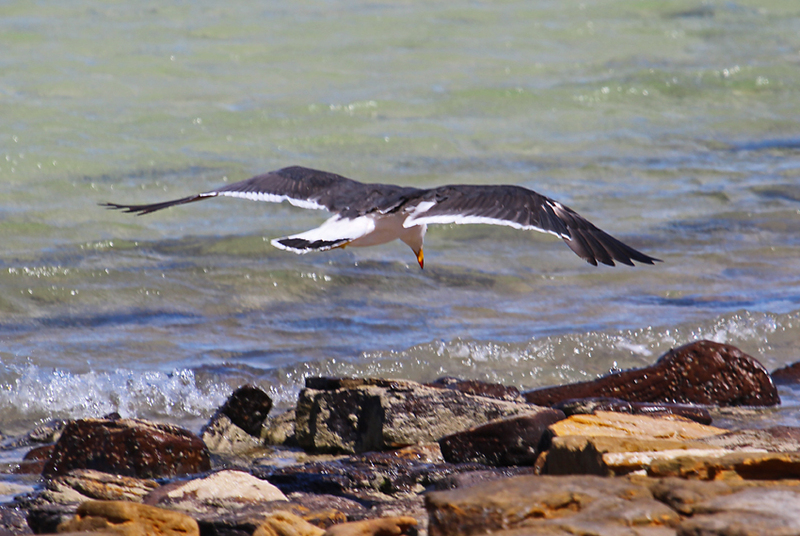 But the birds are some distance away and the overcast conditions make photography all but impossible. I notice thousands of small burrows honeycombing the edge of the intertidal zone. Each is home to a small shore or mangrove crab. In the creek I can see roving schools of silver baitfish eagerly eyed by a pair of herons that are stalking the fringe of the mangroves. Our time at the creek is limited. The clouds are thickening and a few fat raindrops have bounced off my camera lens. As we leave the park has a few more wildlife surprises that make me grit my teeth over the poor lighting conditions. 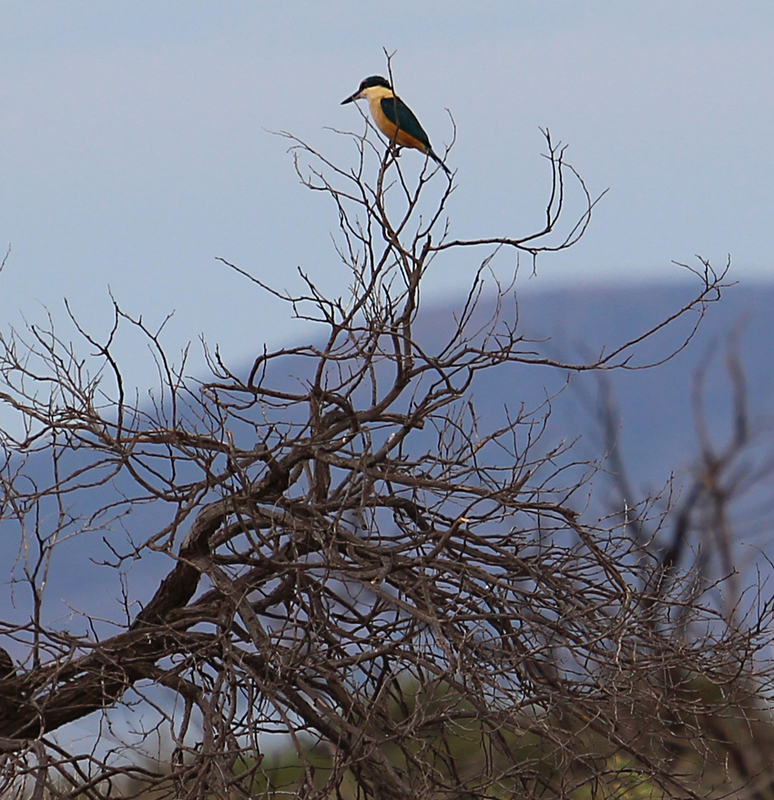 A gorgeous sacred kingfisher perches on a long-dead coastal acacia bush and a group of grazing emus wanders across the saltbush dominated plain. Later, when examining this image in detail I discover that there is another participant in the scene; a grey kangaroo that was feeding close to them. It has been an interesting first look at this coastal environment with its varied habitats and I look forward to further visits in the warmer, lighter months ahead. The hillside behind the cabin is quite steep and the trail leading to its summit zig-zags between rocky outcrops and stands of native pine. Every so often there are depressions and small caves where the rust coloured soil is littered with roo droppings. From the first ridge, the view back across ‘the pound’ is spectacular with the curved formation of peaks that shape this unique environment clearly evident against the deep blue of an outback sky. A little further up the scree slope the sound of scattering rocks provides a tell-tale hint of movement. I freeze, lift the camera and wait; nothing but the thumping sound of a large animal bounding further up the hillside. 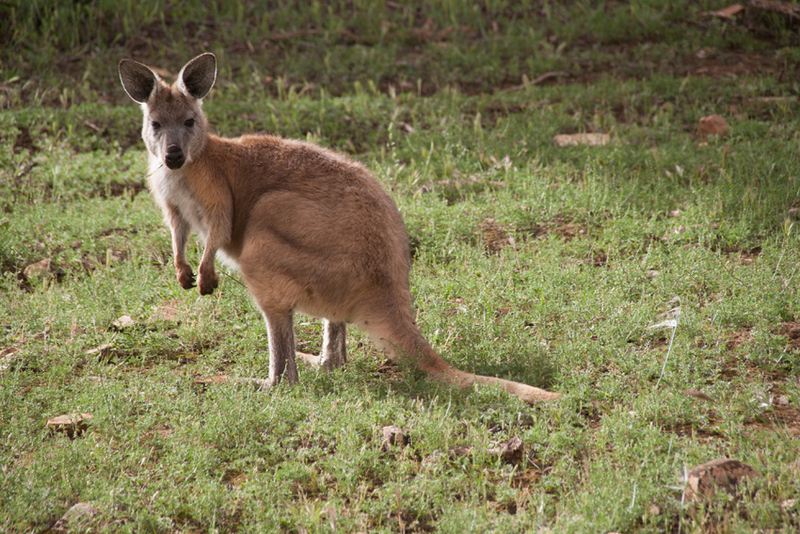 Only a kangaroo makes that sound and only a hill kangaroo, sometimes called a wallaroo or euro, would be living in this steep terrain. 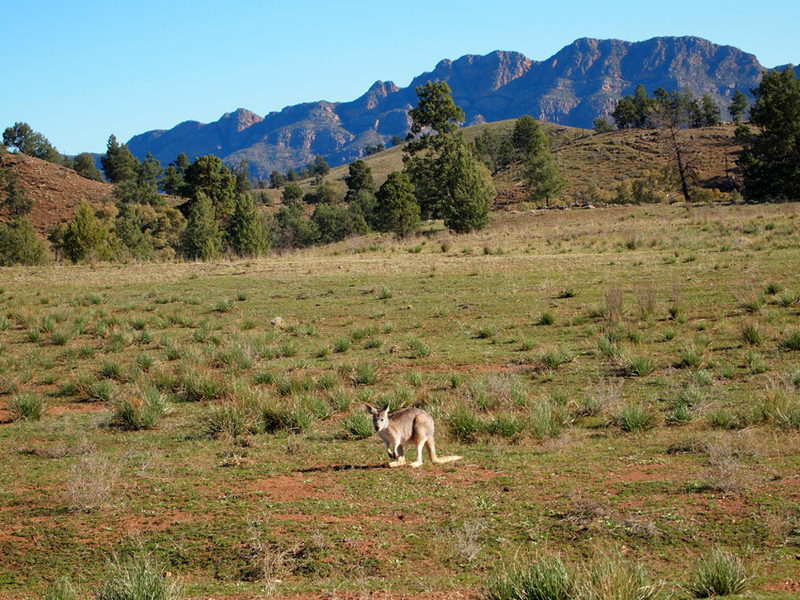 There are three species of kangaroos, as well as their smaller wallaby relatives, living in the Flinders Ranges near Wilpena Pound ; a crater shaped geological formation in South Australia’s northern outback region about five hour’s drive from Adelaide. 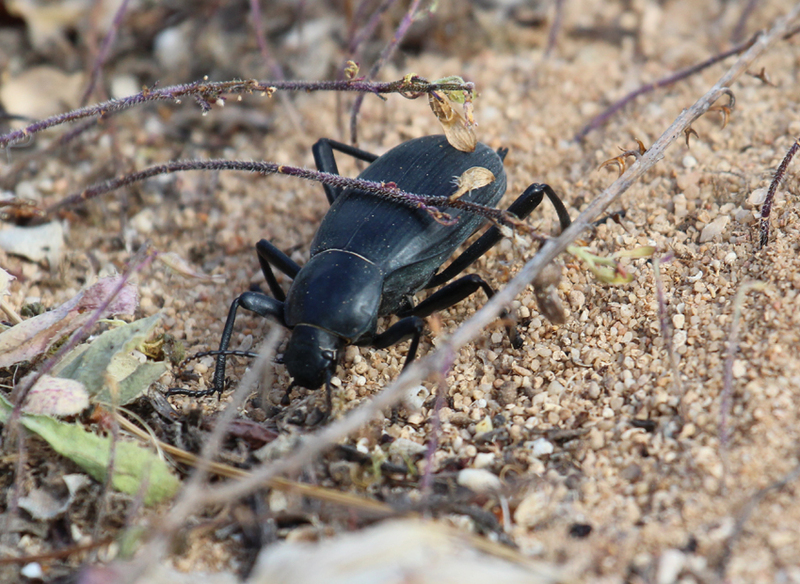 Each species tends to favour slightly different habitats in this arid, semi desert environment though there is inevitably some overlap in their territories. Euros are generally solitary and they prefer rocky outcrops. Their fur is thicker than the other two species and can have a slightl reddish tinge. They are quite stocky, robust kangaroos measuring up to 195 cms from head to tip of the tail with both males and females similar in appearance. 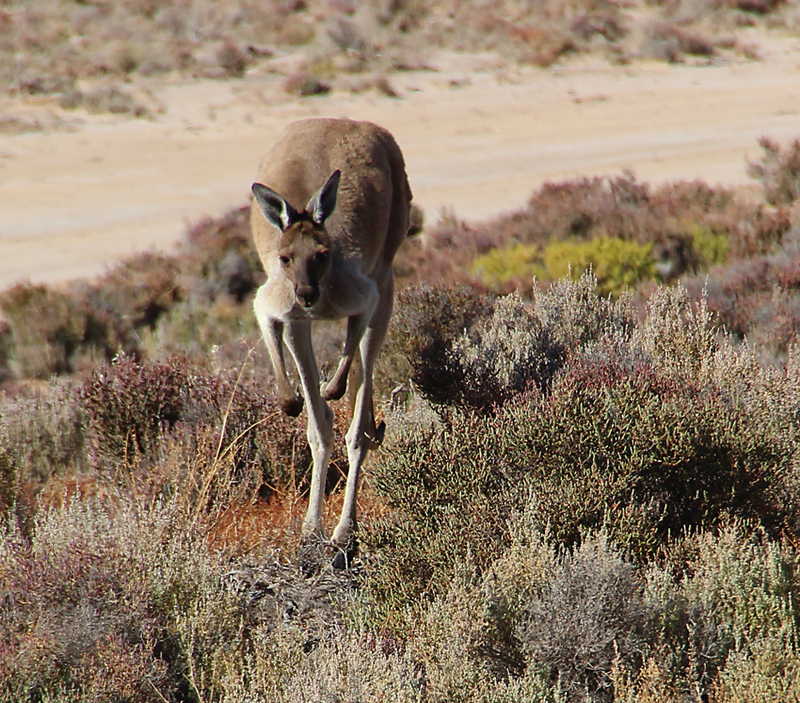 Red kangaroos prefer the open plains and males can measure 2.4 metres and always have a rusty coat and distinct facial markings. 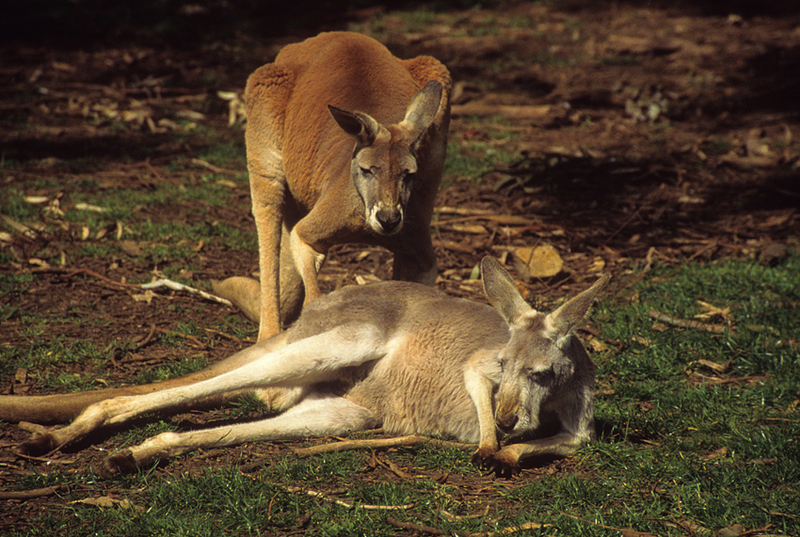 Female red kangaroos have grey fur with a hint of blue shading and are considerably smaller. 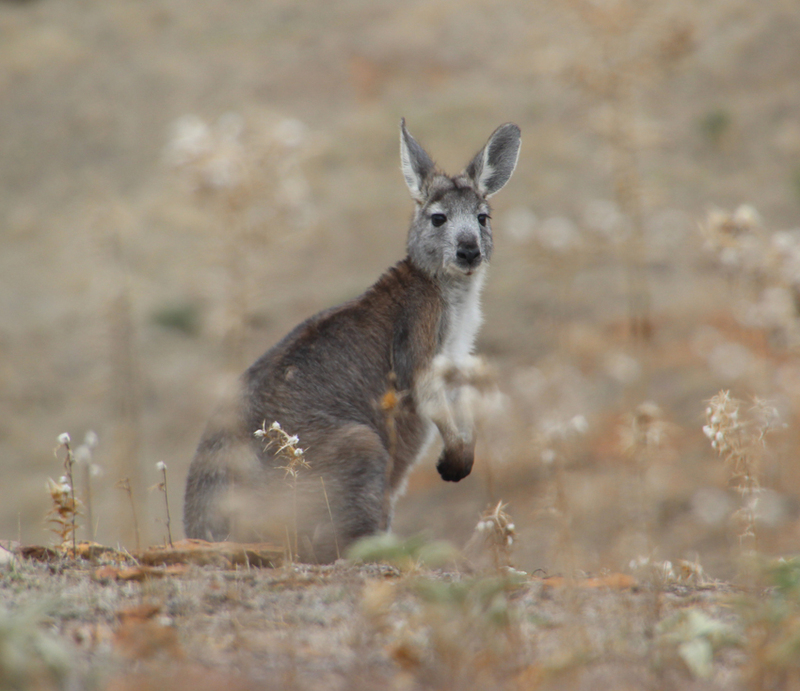 The third species, the western grey kangaroo, is less common in the ranges; they look more like a lighter built euro with smoother fur. 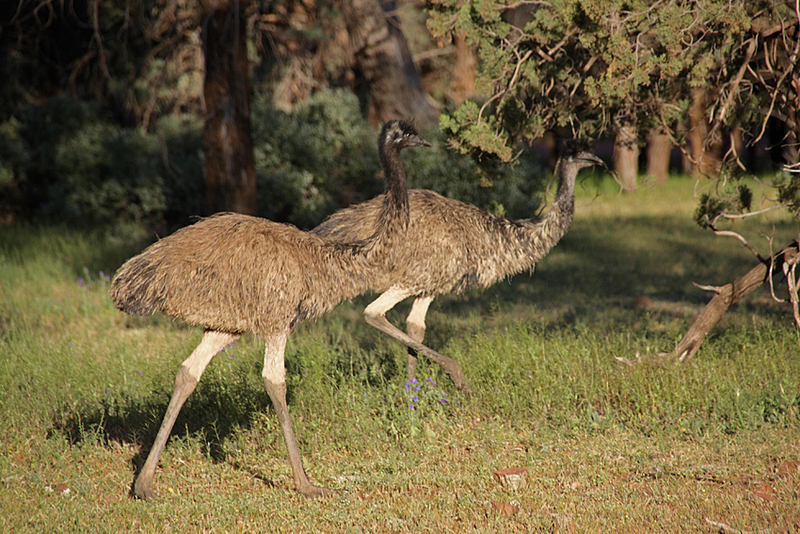 Western greys are gregarious and prefer woodlands. They are the most common species in the southern part of the state. From the top of the hillside I work my way back down a steep gully to the lower slopes where a couple of euros are feeding on the grass and small shrubs growing close to the roadside. They let me approach to within fifty metres before twitching their ears nervously and bounding off into a stand of native pines at the base of a steep hillside. The roadside provides a perfect view of both the rugged escarpments that dominate the terrain and the open grassland that characterizes the entrance to the pound. 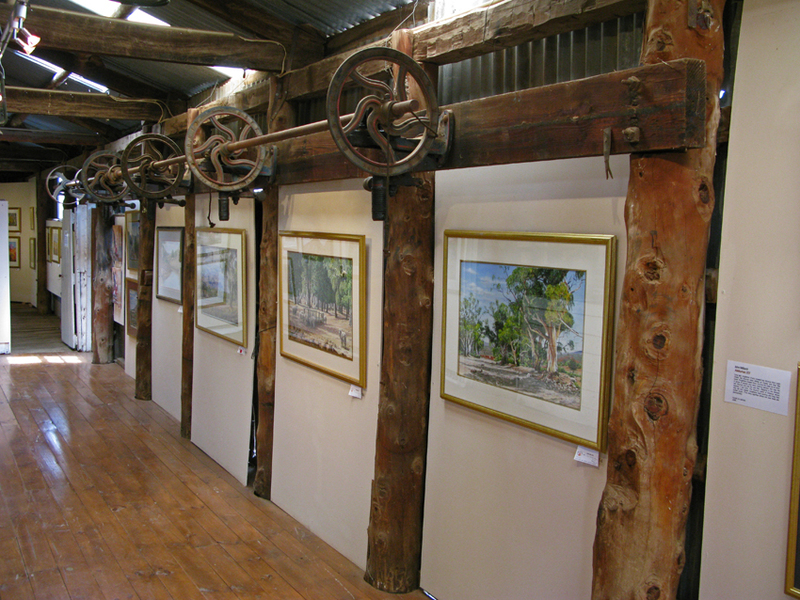 In the distance I can see the outline of several red kangaroos grazing on the grass near an old restored woolshed that serves as a gallery and function centre. They appear to be quite relaxed and as I approach I notice that it is actually a pair of animals; a large male standing close to a resting female. 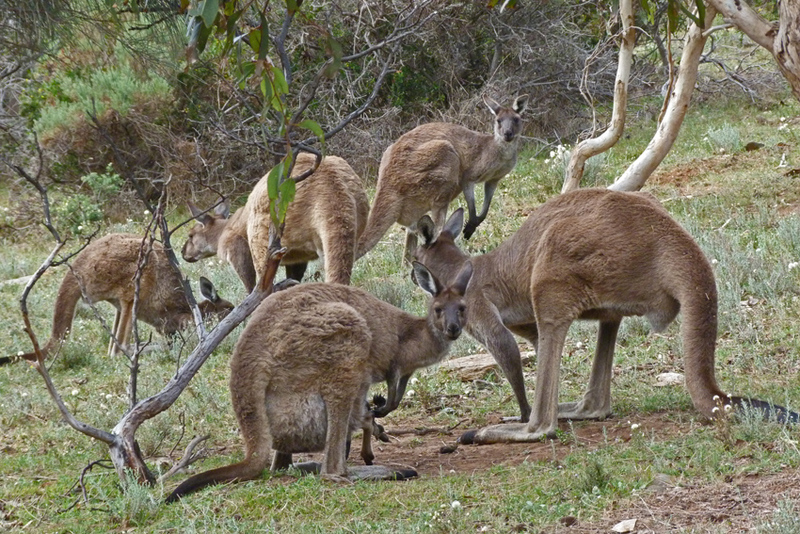 I have been quite lucky on my walk, having seen two of the three local kangaroo species and as if to point out that the landscape is inhabited by more than just marsupials a couple of emus run across the walking trail as I am turning for home. Satisfied with my morning’s work I head back to the chalets for a shower and lunch at one of the two dining areas. 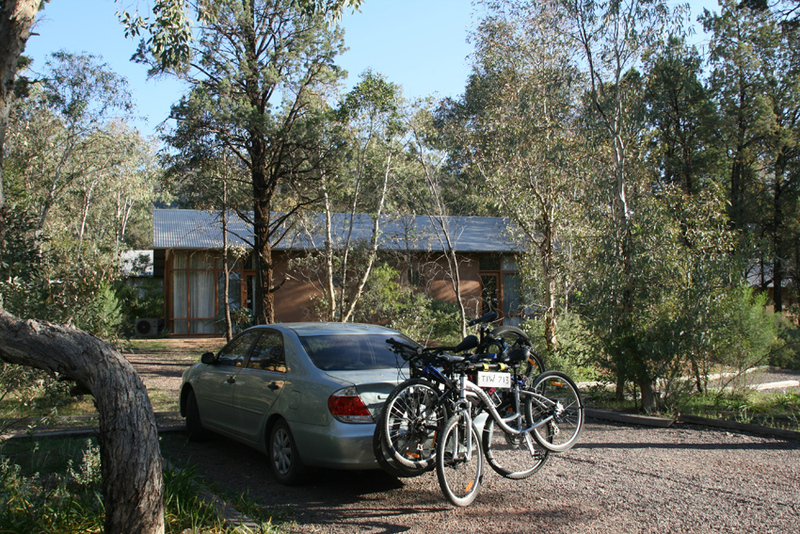 Chalets, dining areas, a well equipped general store and even a small swimming pool for the summer heat; not really roughing it but on the other hand there is abundant wildlife just a stone’s throw away. SA at its very best. 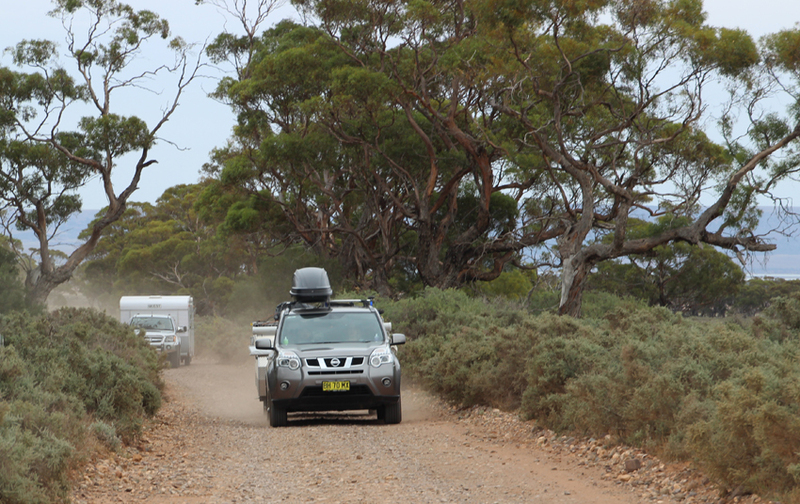 The road from Whyalla to the Point Lowly intersection has dense mallee scrub on both sides. 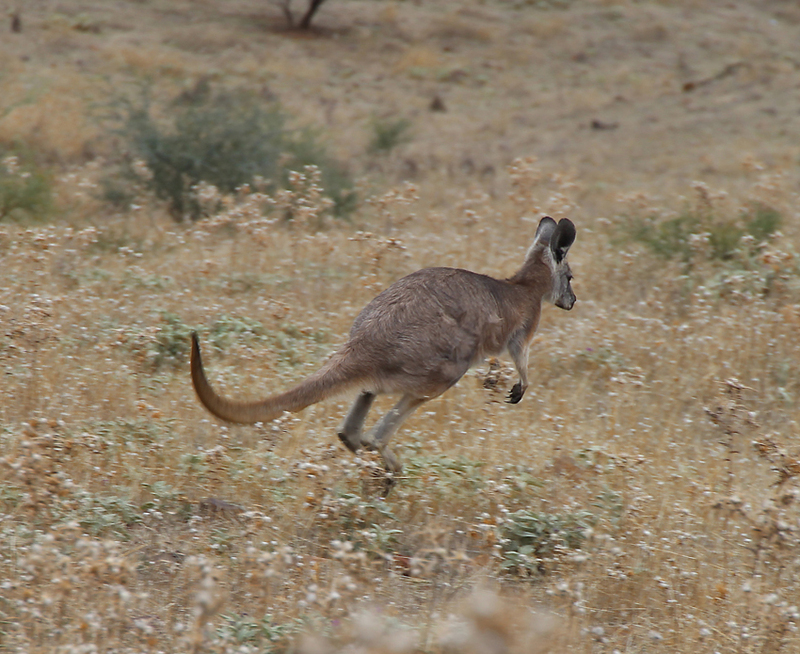 Kangaroos are not uncommon but hard to spot amongst the grey, green foliage. 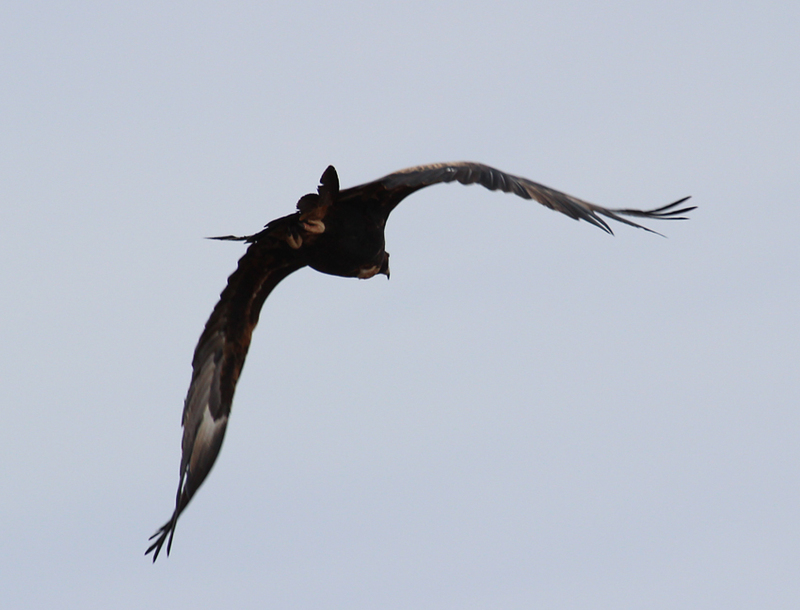 Sometimes a kite or eagle can be seen gliding on a thermal, scouring the scrub for prey. As I turn right and head towards the coast the landscape changes. 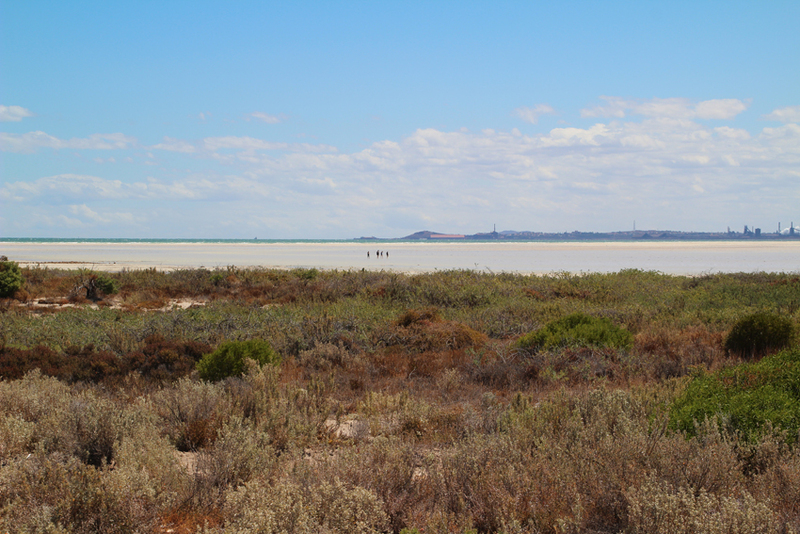 The trees and bushes give way to stretches of saltbush and dried out shallow salt pans. 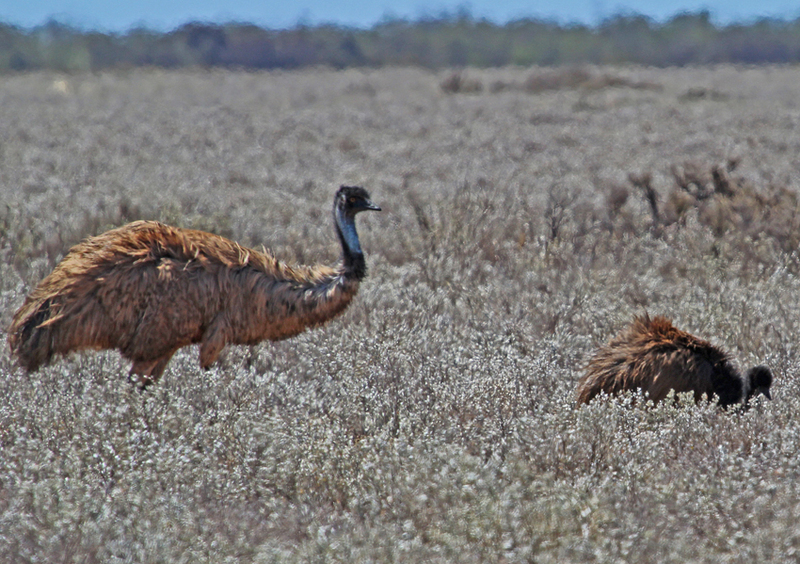 Not much can survive in this country but I have seen emus foraging along these coastal badlands. 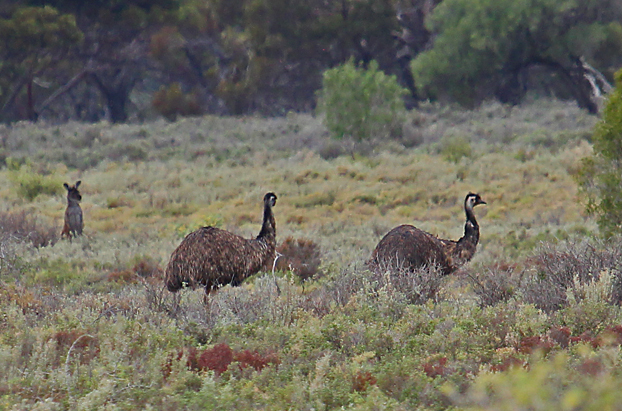 I am not disappointed; catching sight of a fully grown male with his adolescent chicks just a few hundred metres from the fence-line. The road turns quite sharply heading back down the peninsula. 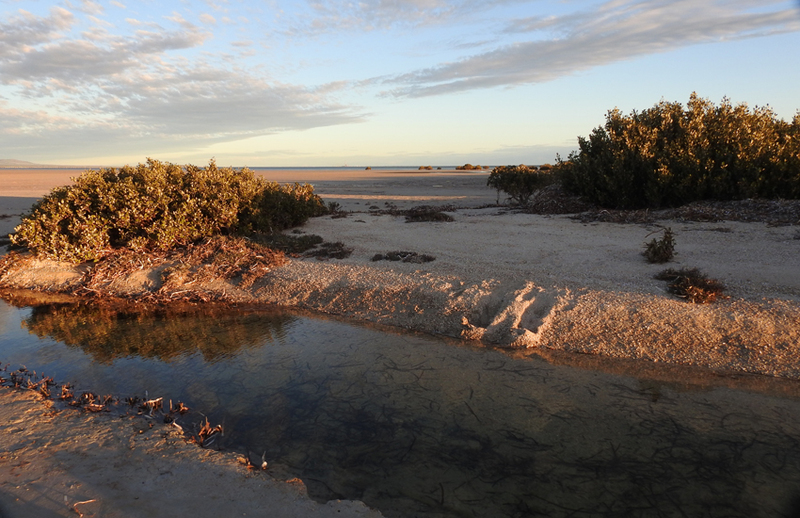 The salt bush landscape reverts back to low coastal scrub. 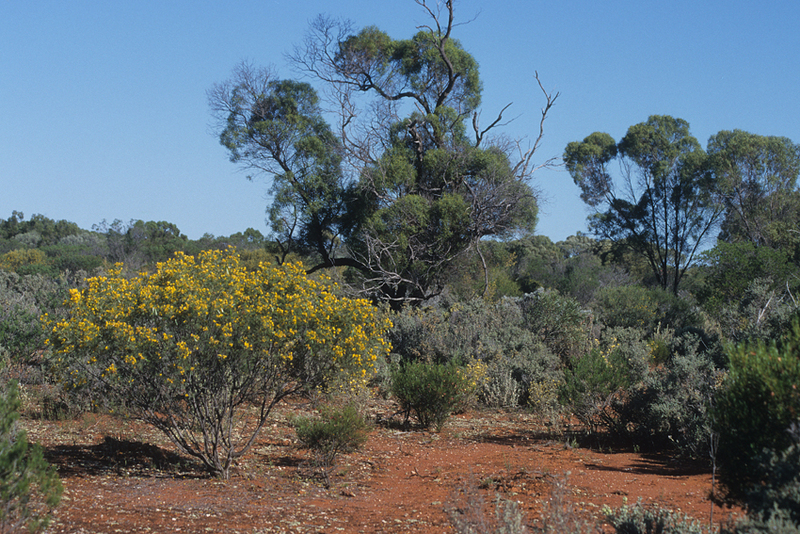 This ecosystem is characterised by acacias and smaller eucalypts where various parrots, wrens and honeyeaters are feeding along the edge of the road. 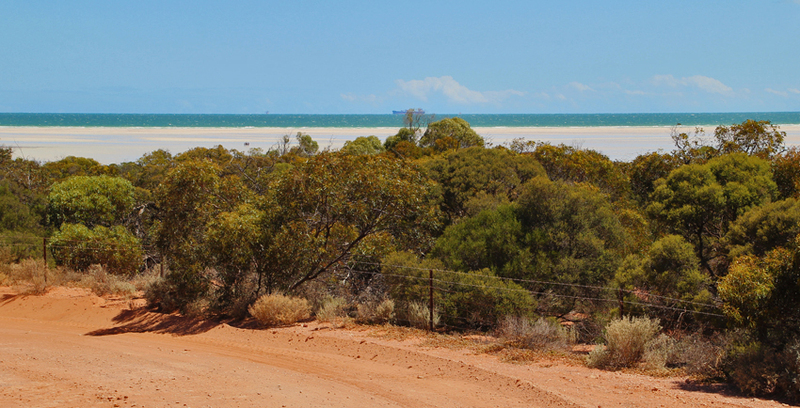 A sandy track leads down to the beach where a small group of shacks nestle into the scrub, all with a wonderful view back across the shallow gulf to Whyalla. After my beach side detour I drive back onto the main road and continue on to my destination. Point Lowly and the associated LPG gas complex of Point Bonython are part of the 12 kilometre Freycinet trail that winds around Fitzgerald Bay. The trail which is ideal for cycling, walking or driving, features interpretive signs that explain Aboriginal and European history as well geological and biological features. However, my trip today is simply exploratory and I will leave the trail for another time. 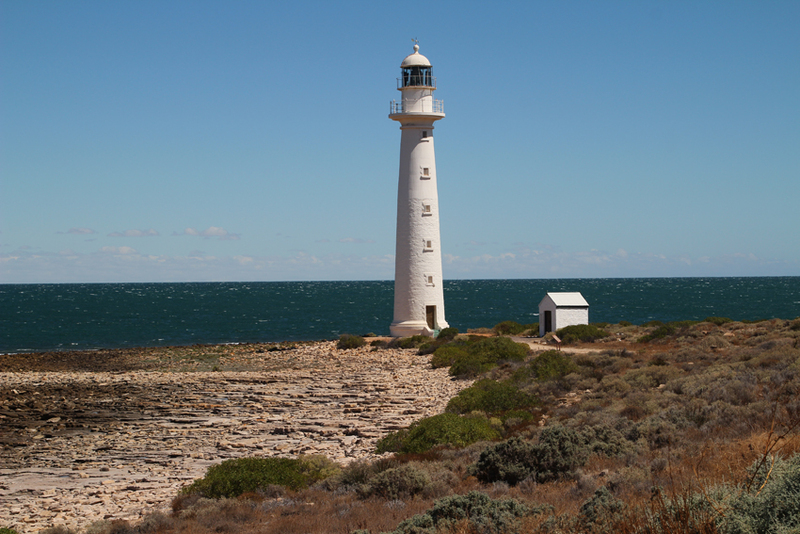 Just a wander around the lighthouse, shoreline and nearby scrub will suffice. And the local sights more than live up to expectations. 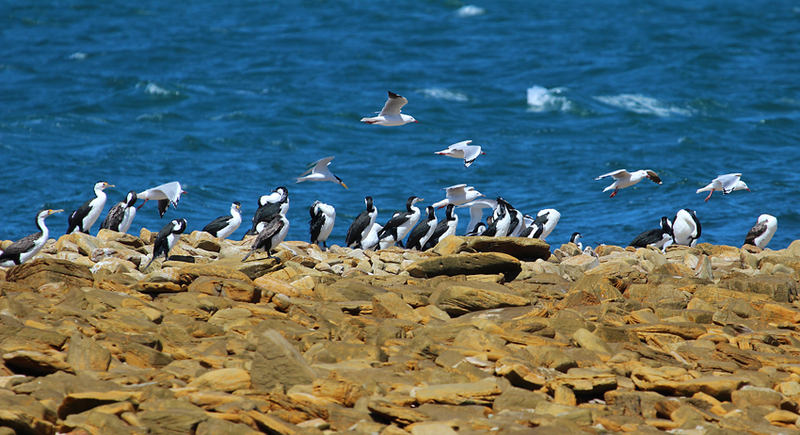 A mixed group of gulls and cormorants is roosting on a rocky outcrop while a pacific gulls glides above the inshore rockpools. Near the lighthouse a glorious little wood swallow perches on the guttering of a local shack expectantly watching a family BBQ. My appetite whetted for the next visit I turn the car and head back.